Cat head piece help? - fursuits, plushies, and costuming - Furtopia | Family Friendly Furry Forum and IRC Chat! Hey guys, so this is really more of a cosplay that's an anthro, and not a true fursuit. Anyway, I'm planning on cosplaying a humanoid cat character, but I'm flummoxed on how to start the head. Fortunately the rest of the body is humanoid apart from the tail and coloring, so I just need some advice on starting a head. I'm sure there's tutorials out there or something, but does anyone have any suggestions or advice on how to start the head? As this character is less 'realistic' and has a more rounded head shape, I figure it SHOULD be a bit easier. Pictures are surprisingly few and not varied, so I'll find one to post here. 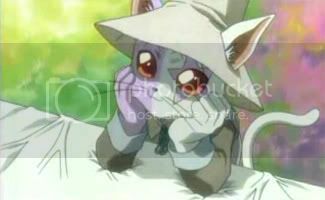 It's the cat Macha from .Hack. Re: Cat head piece help? I can't help you constuction but I am curious. Which cat ?